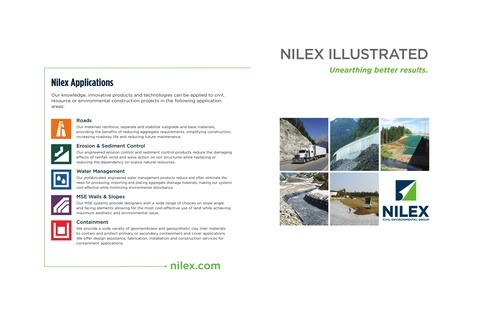 Nilex is a leader in the geosynthetics industry providing innovative solutions to support the unique challenges of civil, resource and environmental construction projects. 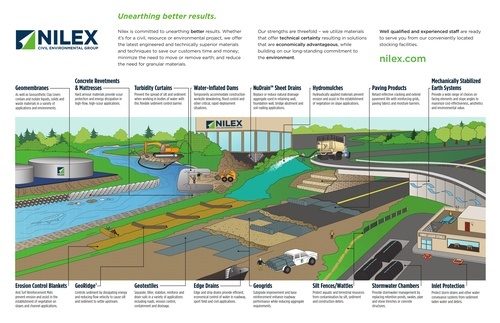 Since 1977, Nilex's engineered, technically advanced geosynthetic materials have provided customers with smart choices and proven alternatives to conventional construction practices for less money. Our smart, environmentally conscious solutions are used in road building, Mechanically Stabilized Earth (MSE) solutions for grade changes, erosion and sediment control, water management and containment. Using the proprietary Nilex ECO2 Calculator, we can calculate the dollar savings and carbon reductions achieved (versus traditional construction methods) by implementing Nilex's engineered geosynthetic materials in your project. In virtually everything we do, Nilex is able to provide our customers with three distinct and concurrent benefits ? economic, technical and environmental. We call this Nilex's three-legged stool. Nilex has offices throughout Canada in Edmonton, Calgary, Vancouver, Saskatoon and Toronto, as well as US offices in Denver, Colorado and Salt Lake City, Utah. With over 40 years? experience, a long-standing commitment to the environment and highly qualified staff, we deliver a broad range of products and technologies that lessen the environmental impact of a project while providing an economic advantage to our clients.